Technical advancements and process improvements in flexography should keep it secure in its key applications. even in the face of competition from digital. 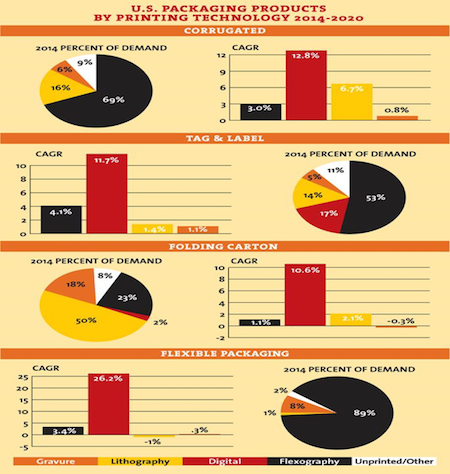 Packaging is a major print industry growth market, and flexo is among the fastest-growing printing technologies. Newly released, the PRIMIR U.S. Market Trends for Flexographic Printing research study, authored by Freedonia Custom Research, provides an understanding of where the market is today, and how brand owner, converter and application trends will impact the U.S. flexographic printing market in the future. According to the PRIMIR study findings, flexography is well positioned for growth with trends in both product run length and substrate usage favoring flexo over gravure and litho. 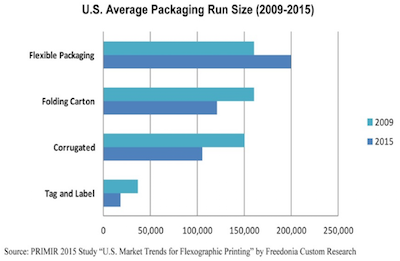 In the U.S., flexography dominates in corrugated, tag and label, and flexible packaging, while coming in second in the folding carton industry, behind lithography. Process improvements have led to higher-quality graphics and faster press speeds, despite high costs associated with printing plates. Flexography’s strength in the tag and label industry resides in its widespread use in pressure-sensitive labels, heat-seal labels, and the growing sleeve label segment. While digital printing continues to gain popularity, it remains competitive primarily in shorter runs. In order to address future competition from digital, the flexographic industry must continue to innovate with an end goal of higher print quality and lower fixed costs. Within the packaging segments, folding cartons are being replaced by flexible packaging and corrugated. Flexible packaging appeals to consumers’ preferences for convenience and portioning, while corrugated makes more sense for bulk purchases. These trends result in a shrinking market for folding cartons with the exception of premium folding cartons used for cosmetics, perfume, electronics, and specialty food products which help to stabilize the folding carton market. The research also revealed an increasing desire in the marketplace to shift away from solvent-based inks and coatings, however, acceptable quality levels for brand owners remain a challenge in flexible packaging. Freedonia reported the likelihood that any technology that cost-effectively enables the use of solvent-free inks and coatings with acceptable quality levels will gain market acceptance. Some of the other innovations in flexography have been a direct result of brand owner demands. Products increasingly are being directed to specific consumer groups. This has resulted in a proliferation of SKUs and niche labels, which, in turn, has increased the demand for shorter run lengths. With shorter runs comes shorter lead times. While digital printing may still be a very small part of the packaging and labeling market, it is expected to grow and put pressure on what was traditionally flexographic printing. Flexographic printers need to become more efficient and effective in driving cost out of the process. Reducing changeover times and waste, while simultaneously increasing print speeds and quality, are important to maintain market share. The use of sleeve technology in place of cylinder or anilox rollers has resulted in shorter changeover times. The use of servo-driven, direct-drive rotary (DDR) motors allows flexographic presses to run at faster line speeds. New innovations in ink help brand owners provide an emotional connection to the consumer. Plastics are gaining ground against paper-based packages. Flexible packaging is establishing a greater foothold in food packaging. Finally, while digital printing is positioned to compete with to flexo in shorter runs, it also offers the potential for hybridization. Presses that work in tandem offer opportunities for flexography to further achieve needed printing requirements from brand owners. The U.S. Market Trends for Flexographic Printing study thoroughly examines drivers and barriers for flexography, as well as, technological advancements in presses, print quality, consumables, inks and substrates. The research focuses on corrugated, tag and label, folding carton and flexible packaging in the food, beverage, pharmaceutical and industrial (including agricultural) vertical markets in the U.S. It also investigates how and where flexo competes with digital, offset and gravure print processes. The study provides growth projections from 2013/2014 to 2020 for flexographic press and consumable sales. Also included is an overview of technological innovations, as well as drivers to expand the process. For more information contact Rekha Ratnam, Assistant Director Market Data and Research, at 703-264-7200 or rratnam@primir.org. An informative video overview of the study can be accessed here. In addition, new task forces are forming for the 2016 studies, which will cover the areas of food packaging compliance, inline finishing solutions, brand owners, MIS/ERP, digital printing technology’s influence on in-plants, and the coatings market. Please visit www.primir.org for more information about this and other PRIMIR research.